Congratulations to Madeleine, who won a copy of Love in the Time of Cholera by Gabriel Garcia Marquez. I love the randomness of random.org in choosing prize winners! I am on my way back to Baltimore today from house-hunting in New Jersey. After a stop over in Philadelphia to see the Frida Kahlo exhibit, we'll be heading home, and hopefully I'll have more reviews up soon (as well as posting my own challenge list for the Neustadt Challenge). I have a terrible back log of reviews to write, including Snow Flower and the Secret Fan by Lisa See and The No. 1 Ladies Detective Agency by Alexander McCall Smith. Thanks to Maggie for the great challenge button! Congratulations Madeline and the button is lovely. Maggie is quite talented. I am glad that you found a house and look forward to your reviews. I won :D Thank-you so very much. I'll send you my address by e-mail. 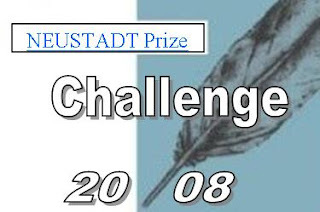 I like this challenge a lot, as I have mentioned before I will be reading other authors after the 3 I chose. Glad you found a place you like, I am looking right now for a place and it isn't easy, lots of dumps before you find what you want. Did you see the movie about Frida Kahlo ? I liked it a lot. Hi Madeleine, I left a message for you on your blog, but thought I'd leave one here, too. My email address is alisiab at mail2world dot com. I thought I commented on your blog with it after I pulled your name, but it might have slipped my mind. Sorry!